Meta Coffee Lab in Your Office! "Coffee is an amazing drink that is connected to people at every step of the process." Tasting Notes: Bright and fruity. A blend of Burundi, Colombia and Ethiopia coffees. This smooth, medium bodied blend is the go-to for the morning coffee rush. If you're just stepping out from the world of blends to single origins, give this a go in your office. We're guessing you'll nod yes to yourself. What happens when you think a little more carefully about the process of this drink called coffee? What makes it special? Where does it come from and who are the people that make it possible? And the one we think about the most: How to enjoy it more deeply? Seeking these answers is what makes Meta Coffee Lab unlike anything else. Mike of Meta Coffee Lab began his coffee roasting journey 12 years ago here in Portland, Oregon. After moving to Lincoln, Nebraska, he and his wife, Suzanne decided to bring their special approach to coffee to their beloved community of Lincoln. As you sip Meta this month, we highly recommend considering the hundreds of people that brought this fine cup of coffee to you. You might find, as we did, that it makes the cup even richer and more complex. Another great thing we admire about Meta is all the coffees they roast aren't just carbon neutral, they're carbon negative. How, you say? For every pound of coffee Meta roasts and you brew, the carbon footprint is about 11 pounds. Meta Coffee Lab doubles that footprint they make and offset it with 22 pounds of carbon credits for every pound of coffee they roast. On this project, Meta Coffee Lab partnered with Arbor Day Foundations Project 2050 to help reforest coffee lands. Which is worth checking out in its own right. See here: Abor Day Project 2050. If you're visiting Lincoln, head to Zipline Brewery for Meta's Nitro Cold Brew and pickup a bag of coffee while you're at it. And if you happen to be there July 26th and 27th 2018, you're in luck. Caffiene Crawl is happening in Lincoln--and Meta Coffee Lab, of course, part of it! After a featured roaster rolls through your office, we often get asked where they can buy coffee for their home. With Meta Coffee, shop here. 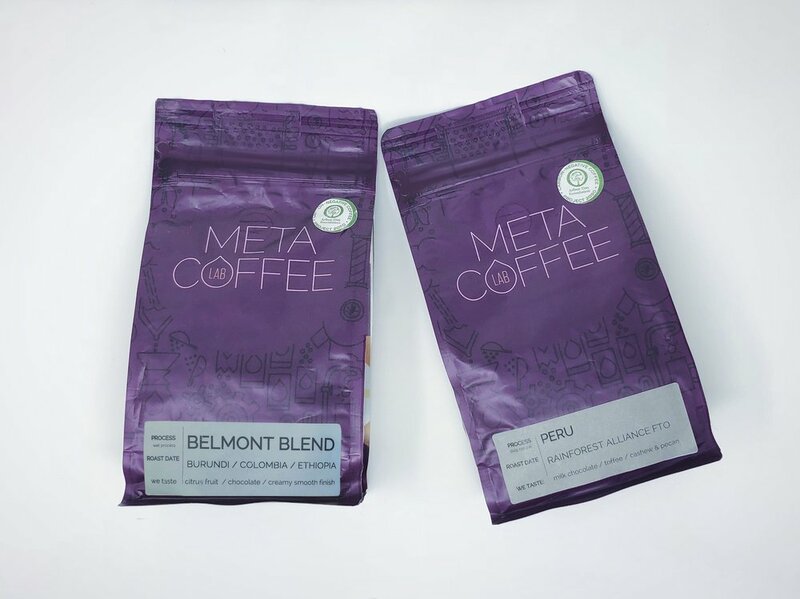 Want Meta Coffee for your Portland office coffee service? Drop a line below or click here. June • Dapper & Wise Office Delivery! Belmont Coffee is located in beautiful Portland, Oregon.